This group was started by Rob R - SSCS UK Area Coordinator & is moderated by Claudia P (SSCS Volunteer based in Canada) in order to promote the work of SSCS on the Care2 network. 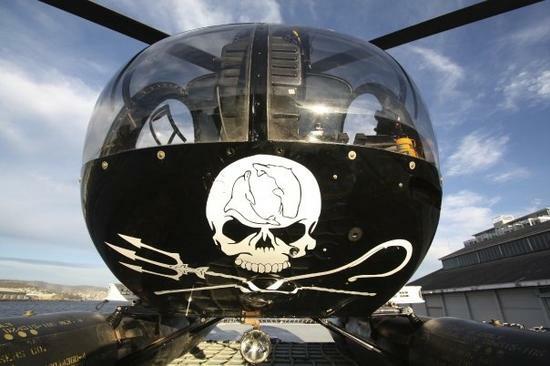 Please visit Sea Shepherd's re-designed website at WWW.SEASHEPHERD.ORG! The ‘Sea Shepherd Conservation Society’ is an international non-profit, marine wildlife conservation organization whose mission is to end the destruction of habitat and slaughter of wildlife in the world’s oceans in order to conserve and protect ecosystems and species. 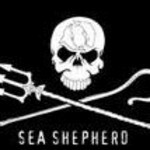 Sea Shepherd's primary mandate is to assume a law enforcement role as authorised by Paragraphs 21-24 of the ‘World Charter for Nature’ as adopted by the United Nations General Assembly on November 9, 1982 which provides authority to individuals to act on behalf of and enforce international conservation laws (specifically- in Section 21 [paragraph E] it says: ‘States and, to the extent they are able, other public authorities, international organizations, individuals, groups and corporations shall: (e) Safeguard and conserve nature in areas beyond national jurisdiction’). We are not a banner-waving organisation and we do not employ any marketing tactics such as ‘mail-shots’ or ‘cold-calling’. We use freely given donations from our members and supporters for direct action campaigns. Sea Shepherd cooperates fully with all international law enforcement agencies and its enforcement activities complying with standard practices of law and policing enforcement. Sea Shepherd adheres to the utilization of non-violent principles in the course of all actions and has taken a standard against violence in the protection of the oceans. The World Charter for Nature proclaims general principles of conservation `by which all human conduct affecting nature is to be guided and judged' (Preamble). The principles call for: nature to be respected and its essential processes not to be impaired; the maintenance of genetic viability and protection of habitats; special protection for unique areas; management of ecosystems and organisms to achieve and maintain `optimum sustainable productivity'; and the protection of nature against destruction caused by warfare and hostilities. CITES (the Convention on International Trade in Endangered Species of Wild Fauna and Flora) is an international agreement between governments, drafted as a result of a resolution adopted in 1973 at a meeting of members of the World Conservation Union (IUCN). Its aim is to ensure that international trade in specimens of wild animals and plants does not threaten their survival and it accords varying degrees of protection to more than 33,000 species of animals and plants. The United Nations Convention on the Law of the Sea ( UNCLOS ), also called the Law of the Sea Convention and the Law of the Sea Treaty (or LOST by its critics), is the international agreement that resulted from the third United Nations Conference on the Law of the Sea (UNCLOS III), which took place from 1973 through 1982. The Law of the Sea Convention defines the rights and responsibilities of nations in their use of the world's oceans, establishing guidelines for businesses, the environment, and the management of marine natural resources. Challenging the Norwegian whaling fleet and Navy. The ‘Whales Forever’ was rammed by the Norwegian destroyer Andenes, fired upon, and had two depth charges deployed under the hull. Although suffering significant damage, the Whales Forever prevented the Norwegians from boarding embarrassing the Norwegian authorities. Sinking the Norwegian whaling ships: The Nybraena - scuttled dockside in December 1992 (Reine, Lofoten Islands). The Senet - Scuttled dockside in January 1994 (Fredricksberg, Norway). The Elin-Toril - Severely damaged in 1997. 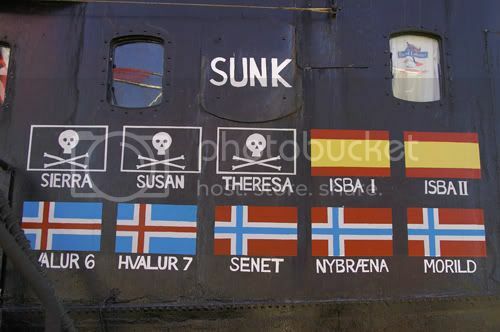 The Morild - Sunk in 1998 (owned by the most notorious whale killer Stienar Bastesen - Sea Shepherd became a household name in Norway as a result). The Williassen Senior - Sunk in August 2007 (Svolvaer, Lofoten Islands). ~Many years of confronting Japan's illegal commercial whaling thinly disguised as ‘Scientific Research’ in the Southern Ocean Sanctuary (AKA the Antarctic Whale Sanctuary) and in Australian Territorial Waters. In Operation Migaloo in 2007 & early 2008 we saved over 500 whales from Japanese Harpoons! During Operation Musashi in 2008 & early 2009 with only one ship against Japan's 7 ship fleet we saved 305 whales from an agonizing death from the deadly explosive harpoons of the Japanese whaling fleet. The Japanese Fisheries Agency blamed the failure to reach their quota on disruptions by the Sea Shepherd Conservation Society. During Operation 'Waltzing Matilda' Sea Shepherd saved more whales than the Japanese poachers managed to kill in the most successful anti-whaling campaign to date! Our Second ship is the Bob Barker - a 1200 ton ice class fast chaser vessel ideal for the Antarctic campaign. Refurbished and fitted with helicopter deck, delta and Zodiac craft, all the Sea Shepherd tricks! Our Third and newest vessel is the MV GOJIRA (GODZILLA - formerly the Ocean Adventurer). The MV Gojira is Sea Shepherd's fast interceptor vessel which will find, track and harass the Japanese whaling fleet during our latest campaign 'Operation No Compromise'. Sea Shepherd are not eco-terrorists (despite Japanese claims) as has been proven in the peer-reviewed paper whose reference is: Nagtzaam, Gerry and Lentini, Pete (2008) 'Vigilantes on the High Seas? 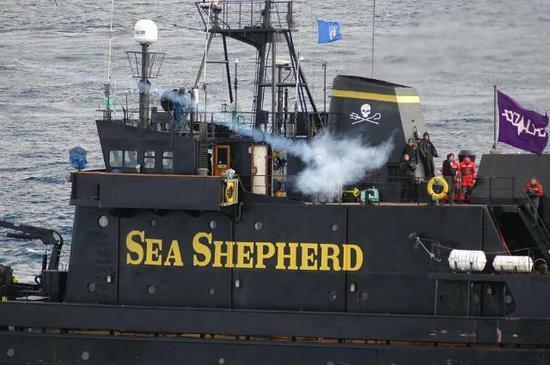 : The Sea Shepherds and Political Violence', Terrorism and Political Violence, 20:1, 110 - 133 - which found that when looking at all of SSCS actions since its creation NONE can be defined as terrorist actions. Sea Shepherd are an policing/vigilante organisation who enforce international laws when no-one else will. "I stand in honorable company as a modern-day pirate, though I've not shot anyone, burned any ships, looted any cargoes or kidnapped anyone. We are also pirates with a sense of humor and a moral code of non-violence. In 30 years of eco-piracy we have never injured a single poacher, though we've sent nine whalers to the bottom. Instead of cannon balls, our guns shoot coconut cream and chocolate pie-filling. We toss stink bombs instead of grenades and we are so non-violent we don't even eat meat or fish on our ships. No fish, fowl or mammals have died in the making of our high seas campaigns. What we do is defend whales from illegal slaughter by profiteering, ruthless and merciless killers. If people want to call us pirates for that, we're proud to be so. We have whales to save and Japanese ships to attack!" 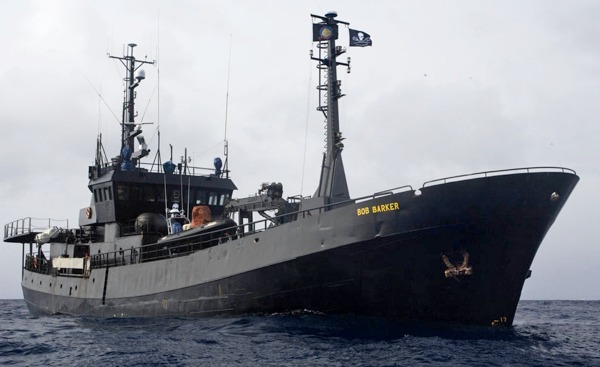 Sea Shepherd's 'MY BOB BARKER' a 1200ton ice class endurance vessel and former Norwegian whaling ship has just been overhauled and is ready once again to intervene against the Japanese Whaling Fleet and against poachers worldwide! 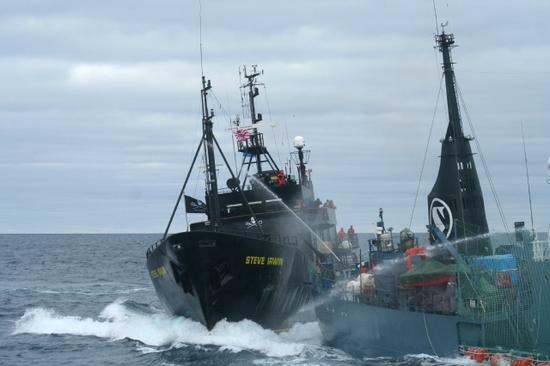 Sea Shepherd Tactics against illegal whaling. WC Commissioners EU: Open Your Eyes, Condemn the Criminals! !